As reported in the New York Times (Microsoft Taps Yahoo Scientists for New York Research Lab) and elsewhere, we’re moving to Microsoft. Your Decision Science News editor will be one of the founding members of a brand new Microsoft Research Lab in New York City. 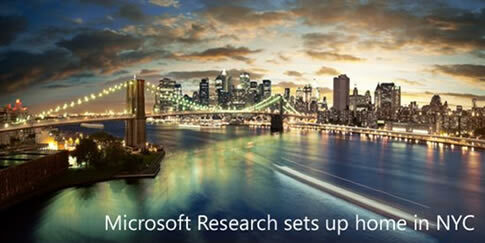 Start Spreading the News … Announcing Microsoft Research New York City! We’re moving to Microsoft NYC was written on May 3, 2012 and filed in Gossip,Jobs,Research News.